Samnak Ecological Park is the largest of the four ecological parks located along the left bank of the Nakdong River between Eomgung-dong, Sasang-gu and Samnak-dong, Sasang-gu (Gangseo Nakdongdaegyo Bridge). The park is situated within a migratory bird sanctuary designated as Natural Monument 179 and features marshland, a site to feed migratory birds, a lawn square, wild flower beds, walking trails, bicycle paths, automobile camping site, water sports center, and outdoor exercise equipment. Directions: Sasang Station (Metro line 2), Exit 3. Walk 15 minutes towards the riverside, or get off at Gwaebeop Renecite Station (Busan-Gimhae Light Rail Transit), exit 1. Access the park via the connecting bridge. Facilities: Samnak outdoor swimming pool, Gamjeon wildflower garden, Samnak marsh eco-park (June – October), bicycle rental, exercise equipment. Eulsukdo Park includes two parks – Eulsukdo Migratory Bird Park, located at the lower part of Eulsukdo Island and Eulsukdo Eco Park, located at the upper part of Eulsukdo Island. You can watch a spectacular array of migratory birds in different types of marshes, including salt and freshwater marshes in the park during the winter migratory season. Directions: Take metro line 1 to Hadan station and get out at exit 3 → transfer to Bus nos. 58, 58-1, 58-2 → Get off at Eulsukdo Service Area bus stop. Facilities: Nakdong Estuary Eco-Center, Amisan Observatory at Nakdonggang Estuary, Eulsukdo Cultural Center, Wildlife Medical Center, sports park, bicycle rental stand and more. Maekdo Ecological Park is a natural riverside park, located along the right bank of the Nakdong River between Myeongji-dong, Gangseo-gu and Daejeo 2-dong (Nakdongdaegyo Bridge). The park is a Migratory Bird Sanctuary designated as Natural Monument 179. Directions: Take the village/neighborhood bus Gangseo 13 and get off at Maekdo Ecological Park bus stop then walk about 5 minutes toward the riverside. Facilities: outdoor exercise equipment, soccer field, baseball field, bicycle rental, observatory deck, aquatic botanical garden, lotus field, drinking fountain, bench, bicycle rack, outdoor table, restroom and more. 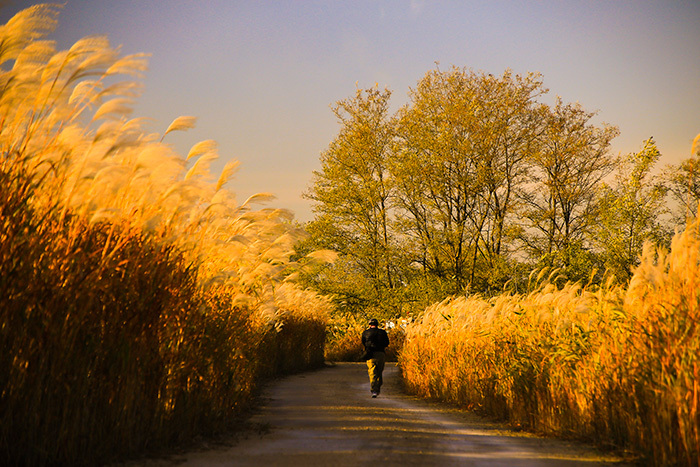 Daejeo Ecological Park is located along the right bank of Nakdonggang River between Gangseo Nakdongdaegyo Bridge and Gupo Nakdongganggyo Bridge. 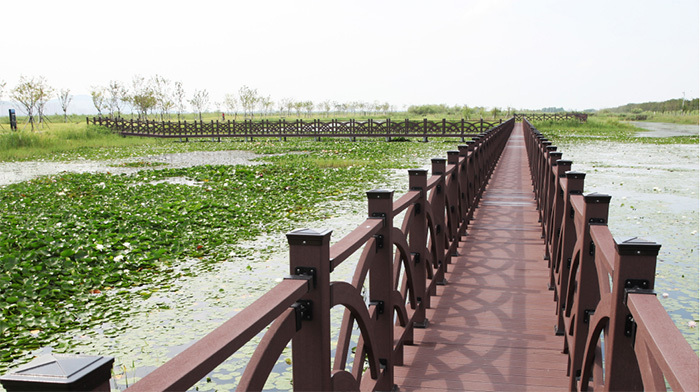 The park features wetlands, a waterway, grassland, Yuchae flowerbeds and various outdoor exercise equipment. The Yuchae Flower Festival takes place every April in a 370,000㎡ area of Yuchae flowerbeds in the park. The park becomes one of the popular tourist attractions in Busan during the festival. 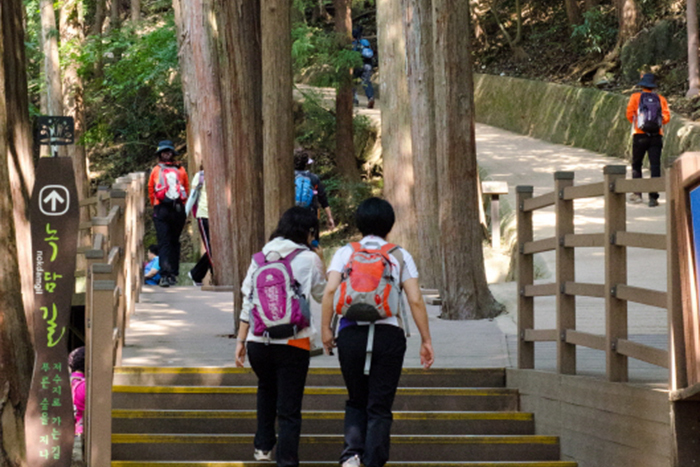 Facilities: Outdoor exercise equipment, bicycle rental, Yuchae flowerbeds, restroom and more. 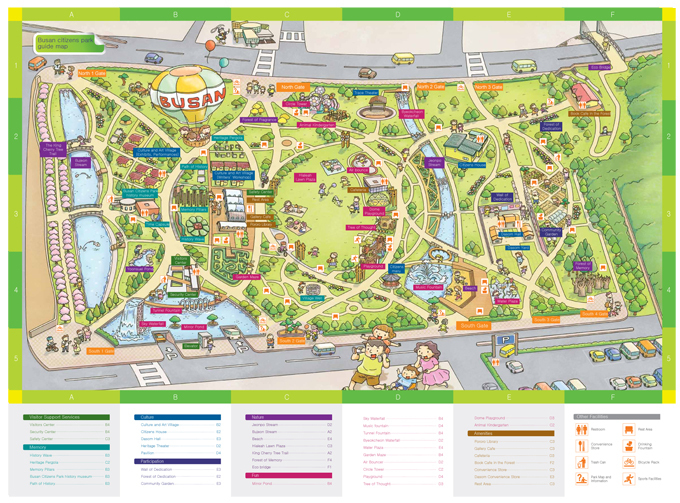 Hwamyeong Ecological Park is located along the left bank of the Nakdong River between Nakdonggangdaegyo No. 2 and Daedong Hwamyeongdaegyo Bridge. The park, close to Hwamyeong New Town, has various sports facilities, including a baseball field, soccer field, tennis court, basketball court and inline skating rink for nearby residents. Take metro line 2 to Sujeong Station. Walk about 10 minutes. Take metro line 2 to Hwamyeong Station. Walk about 10 minutes. Facilities: bicycle rental, outdoor exercise equipment, aquatic botanical garden, lotus field, outdoor swimming pool during the summer season, water sports center, walking trail, restroom and more. Children’s Park is an urban nature park located on a slope between Baegyangsan Mountain and Geumjeongsan Mountain, which is a great resting place for the family. The area is home to the former Seongjigok Reservoir and provides walking trails within a dense forest. Facilities: hills and hiking trails, gardens, a lake and streams, paid parking lot, sports equipment, Samjung ‘The Park’ Zoo (paid) and more. 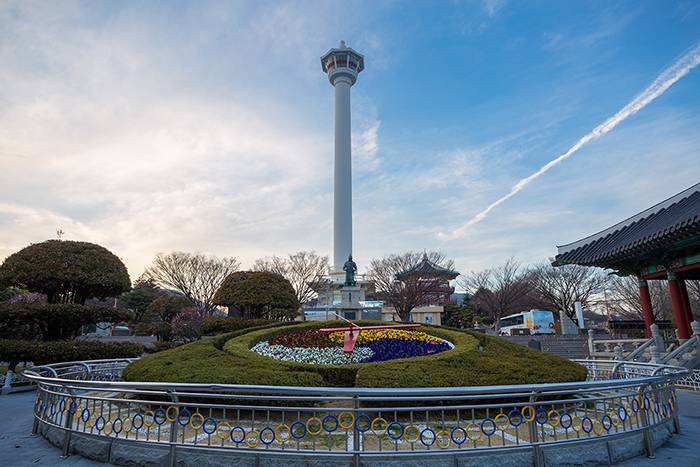 The park is located on a hillside called Yongdusan in Jung-gu and has Busan Tower on the top. The 120 meter high Busan Tower is a famous landmark in Busan and loved by tourists. Busan’s unique beauty below is able to be viewed from the observatory. This park has been praised by Busan’s citizen for a long time as a tranquil downtown rest area. Directions: Take Metro Line No. 1 to Jungang Station (Exit 5) and then walk about 5 minutes towards Yongdusan Park. Facilities: Busan Tower (Paid), Octagonal Pavilion, flower clock, the bell of the citizens, statue of Yi Sun-sin, duty free shop and more. Nearby attractions: Jagalchi Market, Gukje Market, Busan Museum of Movies and more.